What vision do you see for your life when you close your eyes, is it a future filled with success, achievement and abundance, or is it one filled with struggle, poverty and frustration? Much like the great artists envisaged their works in their minds before painting or sculpting them, so to are you envisaging your future be it good or bad and then going about each day creating it and making that vision a reality. As Donald Trump says, ‘if you’re going to be thinking anyway, THINK BIG’, and it’s advice each one of us can adopt with the vision we hold for our future; whatever level you’re at in life, there’s always room for improvement and there’s always the potential to take it up a notch and envisage something far beyond what you may have once thought possible for your life. How far outside your comfort zone are you willing to go to achieve your dreams? If you look at the lives of successful individuals, among the common threads is the willingness to step outside of their comfort zone irrespective of whether they feel like it or not; those who achieve very little on the other hand allow their emotions to control their actions and spend their lives tucked up nicely inside their comfort zone, thereby condemning themselves to never achieving anything more than they already have. It’s important if you’re to achieve you deeply held dreams in life that you’re willing to push yourself on a daily basis to step outside your comfort zone and take action irrespective of whether you feel like it or now; it’s that very action on a daily basis that will see you standing tall on the victory dais having achieved your dreams when so many others let fear and doubt stop them dead in their tracks. “Happiness is the meaning and the purpose of life, …. My mentor, friend and business partner said something to me this morning that really struck a chord with me this morning that just because you’re successful, doesn’t mean you’ll feel fulfilled. So many people are out there chasing a recipe for success sold to them on the premise that if you work hard and become wealthy that you’ll feel happy and fulfilled, but it’s not the case, sure it’s an awesome goal to become wealthy after all, poor people can’t help poor people, but if we’re to achieve long term happiness in our lives, we have to look beyond what the world deems as success and invest our time doing something that serves others and brings with it a feeling of fulfillment, and a feeling the world’s a better place for our being here. As with everything in life, the choice is yours and yours alone; you can become wealthy doing almost anything in life, you may as well do it doing something you love and something that makes you come alive rather than following the well worn path which merely leads eventually to a feeling that you’ve traded your greatest asset, the best years of your life for a dollar. Great Grandparents and Quotes…Miss You Mom! I’ve been thinking about my Mom a lot lately. I sure wish she was alive to see our grandbaby! Although, I know she is here in spirit, as I feel her all around me. I’m going to have to get my Dad here at my house more often! 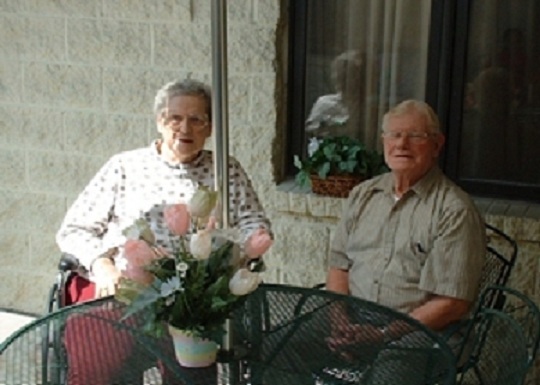 Below is a pic of my Mom and Dad at St. Ann Assisted Living. Some Awesome Quotes To Share…Enjoy! Being a Grandparent is the best feeling there is. I thought I’d take a break from Motivation today to focus on love, because so often I see people go after worthwhile goals with grand visions only to lose perspective on what’s truly important and sacrifice those we most care about for something which are wonderful as a goal realised is, won’t replace the feeling those closest to us give us. I’ve been guilty of it myself, I’ve taken the love of someone very special for granted only to wake up one day to find they were no longer there, but amidst the pain of losing them, along with it comes a wakeup call to get your life in balance, to keep goals in perspective and to never stop investing your time into making the one you love feel like they’re your number one priority in life. The question is, if you are living out of balance and not giving those who are most important to you the time, attention and love they deserve, are you going to wait until you wake up and find they’ve boarded another train, or are you going to learn from the mistake both myself and countless others have made and begin today to reorder your life so that you always keep the main thing, the main thing. I was always fascinated as a child why it was that two people could face the same set of circumstances yet react so differently to them, where one sees it as a blessing and the other sees it as a curse. When most kids were out playing, a lot of my childhood was spent lying in hospital beds, yet far from looking upon the circumstances I faced as tragic, I managed to find the good in the situation which led me down a long path to where I find myself today, publishing inspirational and motivational writing to readers in over 60 countries, none of which would have happened had I not sought out the good and chosen instead to use it as an excuse for a lifelong pity party. We can’t always control what’s going to come our way and what circumstances we’ll face, but we can control how we respond to them and whether we choose to see it as a blessing capable of taking us onward and upward, or whether we see it as a curse and let it forever steel our energy, passion and desire to seek out and live the life you were born to live. "The greater danger for most of us lies …. So many people allow fear to stand in the way of dreaming big and taking action towards big goals, yet let me ask you, would you rather be a massive success as someone who aims to become a millionaire and hits it, or be a massive failure in someone who aims to become a billionaire but barely got a quarter of the way there? While money is just used as part of the analogy, it illustrates a valid point that we need to change the way we view failure and raise our vision as to what’s possible for us to achieve in this one lifetime we are each blessed with, so that each of us can get to the end of it knowing we didn’t settle for small dreams just because we were fearful of failure, but that instead we gave a massive dream everything we had knowing that win lose or draw we achieved far more success than those who chose to play it safe. He is sitting up on his own, (actually has been for awhile), and trying really hard to crawl. He is so close now!! He gets so frustrated and buries his head on the floor and cries. 🙁 It breaks my heart when he does this. We’ve been working with him day by day. Making trail mix can be fun and easy, especially for your kids. In fact some of the various trail mixes on the market today are kid friendly and are quite healthy for you. However, some are not. There are many factors into making these energy booster snacks without including all the things that hinder good, healthful eating habits . There are specific ingredients to look out for. Some of these are loaded with sugar and fat, and that of course defeats the purpose of eating what is good for you. There are so many variations of these delicious mixes and also lots of fun ways to make them nutritious and good for the whole family. Trail mix snacks are also ideal for camping, as they are easy to just grab and go. So, what can be bad about them? Too Much Of A Good Thing – Too often these goodies are packed with tons of sugar. Did you know that dried fruit is higher in sugar than fresh fruit? Yep! To make them dried, they are dehydrated and that of course removes the water. Grapes are perfect as an example. One cup of grapes holds 50 to 60 calories. Whereas, raisins has approximately 350 to 400 calories for one cup. That’s insane! So you DO have to watch out for sugar that goes in these “so called” healthy snacks. Diabetics especially should be aware of all the sugar hidden in these gems. There are many other nutritious foods that can be added to these mixes. Watch The Fat Intake – Peanuts and cashews are high in fat. You can replace them with soy nuts. Also pistachios has less fat and calories than peanuts. You can also try using sunflower or pumpkin seeds for added protein. However, use pumpkin seeds in moderation, as they are normally high in fat. Sunflower seeds has less fat. Toss The Salt Shaker – You also have to watch out for peanuts and pretzels due to the added sodium. Opt for unsalted nuts and pretzels for more healthier snacks. You can also purchase low sugar or sugar free dried fruits at various heath food stores. Also one of the lowest sugar dried fruits is apple. Figs are another healthy choice. If you must use high sugar coated treats, use them in moderation. When preparing these goodies, you can toss them in tight ziploc baggies that are easy to take along on picnics, walks, or wherever you go.